7.5 oz Yakima is a sea salt smoked with apple wood, giving it a dense, yet slightly sweet flavor, fruity character and aroma. 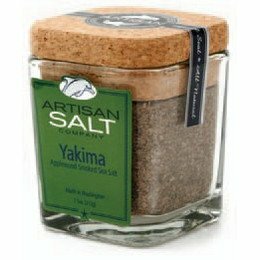 Sweet applewood from the Yakima Valley fuels the fires that flavor this smoked sea salt. Aged Applewood is one of the fruit woods used in smoking. 7 oz size, comes in a glass jar with a cork top. A must have for your pantry to give that special flavor to your dishes.